Select the Fire TV device you want to see. 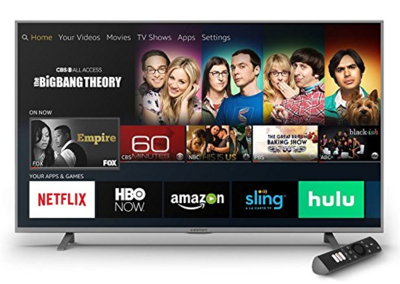 Fire TV Stick 4K is a powerful 4K streaming stick that delivers a vast selection of movies and TV shows instantly with the included all-new Alexa Voice Remote. In addition to 4K Ultra HD and HDR10, Fire TV Stick 4K adds support for HLG, Dolby Vision, and HDR10+ for improved picture quality. Feel scenes come to life with immersive Dolby Atmos audio when connected to compatible home audio systems. The all-new Alexa Voice Remote can control Fire TV Stick 4K as well as power and volume on a wide range of compatible IR-enabled devices, including TVs, sound bars, and A/V receivers. With this new remote, you can also ask Alexa to switch TV inputs, change the channel on compatible cable/satellite set top boxes, view live camera feeds, or control lights, thermostats, and other compatible smart home devices. The Fire TV Stick 4K will also be available in multiple international marketplaces. (High Efficiency Video Coding) video/hevc Hardware accelerated up to 3840x2160p (4K) @ 60fps, 35 Mbps, Main 10 Profile Level 5.1, Color space 8-bit and 10-bit input with HDR10, HDR10+, HLG, and Dolby Vision support in rendering pipelines. MPEG-2 video/mp2t Hardware accelerated up to 1080p @ 60fps "?" Far-field Voice Support Supported only through linked Alexa-enabled device. See the details in the "International Availability" section for Alexa support in other marketplaces. Infrared Blaster The included All-New Alexa Voice Remote can control the Fire TV Stick 4K and certain functions (such as power and volume) on a wide range of compatible IR-enabled devices, including TVs, sound bars and A/V receivers. Note: Certain functions may not be available on some IR-enabled devices. No Fire TV devices have location services, front-facing cameras, multitouch, accelerometers, compasses, or gyroscopes. - Dolby-Vision support for profiles 5, 8 and 9 to max corresponding level. Level 9 for profiles 5 and 8. Level 5 for profile 9. OpenGL (Open Graphics Library) refers to support for 2D and 3D graphics rendering. DIAL (Discovery and Launch Supported. Apps for Fire TV require changes to your app's Android manifest to be discoverable. See DIAL integration. Amazon In-App Purchasing Supported. Use the latest version of the App Tester. 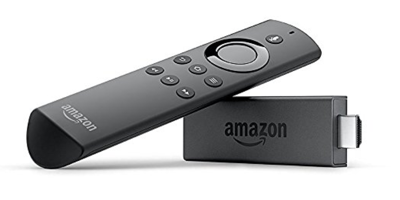 In the US, UK, and German marketplaces, FireTV Stick 4K provides far-field support through a linked Alexa-enabled device and near-field support through the remote control. Alexa support in India, Japan, and Canada will likely follow at a later date. If a user in India, Japan, or Canada currently tries to use Alexa, only keyword search will be available, not Alexa functionality. If the user belongs to some other marketplace where Fire TV Stick 4K is sold (other than US, UK, Germany, Canada, Japan, and India), the user will not have voice functionality at all, the microphone button will not work, and Alexa-enabled devices will not be available to pair. Users will need an account in one of the Alexa-supported marketplaces to register the device. Tip: For more details about localization, see Distribute Your App Internationally. Fire TV Edition - Insignia HD provides high-quality 2K streaming at a low cost. The tech specs are comparable to the Fire TV Edition - Toshiba HD (2018). As with other Fire TV Edition smart TVs, the Insignia HD ships with Fire OS 6 (based on Android N). The Insignia HD has a max video resolution of 720P HD / 1080P FHD @ 60 Hz, with an Amlogic-T950Y system on chip and 1GB DDR4 memory. The software UI is the same experience as with other 2018 Fire TV Editions — you can control many settings and inputs through near-field voice (using your remote control) or through far-field voice using a linked Alexa device. When setting up the Insignia HD, you aren't required to have an Amazon account to install popular streaming apps. Several screen sizes are available: 24" (720p), 32" (720p), and 39" (1080p). H.263 video/3gpp Hardware accelerated up to 704x576p non-secure. Supports H.263 MPEG-4 Part 2. VP8 video/webm Software-accelerated. Secure (Widevine L3 only) and un-secure. Works well for 720p/30fps. (No Amazon.com sign-in required) Supported. Customers without Amazon accounts can access key apps, live TV, input switching, and more. This FAQ is common for all Fire TV Edition devices. Fire TV Edition refers to any smart TV with Amazon Fire OS built-in to the television hardware. As you develop apps for Fire TV, here are answers to a few questions you might have about support for Fire TV Edition. 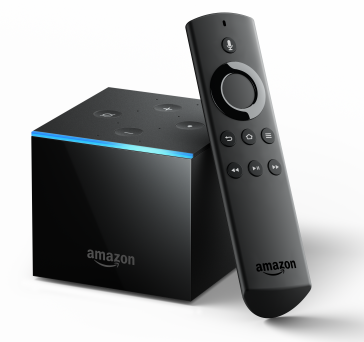 Q: If my app works on other Amazon Fire TV devices, will it work on Fire TV Edition? Yes, if your app works on Fire TV or Fire TV Stick, it will most likely work on Fire TV Edition. 99.9% of Fire TV apps are expected to work on Fire TV Edition. For any apps you already have in the Appstore, Fire TV Edition will automatically be added as a supported device — you don't need to do anything. If support for Fire TV Edition fails, you will be notified by the Appstore team. Q: Why would an app fail for Fire TV Edition? If you targeted your code for specific build models, such as AFTS (instead of using the wildcard AFT*), Fire TV Edition will not be included. Q: How can I target Fire TV Edition models in my code? To target Fire TV Edition in your code, you can check for AFT* in the android.os.Build.MODEL combined with the Build.MANUFACTURER, which will return Amazon. See Identifying Amazon Fire TV Devices for more details. Q: How do I target Fire TV Edition in my manifest? Currently, you can't target any Fire TV devices through your manifest. When you upload your APK into the Appstore submission portal, on the "APK Files" tab, you must indicate support for Fire TV Edition devices in the same way that you indicate support for the other Fire TV devices — by manually moving a slider to indicate support for that device. Q: What features can I access/leverage on Fire TV Edition that I previously was unable to use on other Fire TV devices? For apps, Fire TV Edition does not give you access to any special new features. The device itself has some new UI elements, such as the ability to toggle between inputs (and see a preview of the input prior to switching), aggregation of live content on a row called "On Now", the option to select over-the-air (antenna) content, the ability to control volume, power, and other TV features using your voice, and a remote with extra buttons buttons. However, apps launch and function in the same way as with other Fire TV devices. Q: Does Fire TV Edition have more horsepower to run more CPU intensive games? In general, Fire TV is geared toward casual games, not graphic intensive/immersive games. You can see the graphics specs for Fire TV Edition in the OpenGL Properties and Limits section above. Q: Can I map the new buttons on the Fire TV Edition remote controller to my game? No, the additional buttons on Fire TV Edition remote controls (volume up, volume down, power, Netflix, Amazon Video, etc.) are owned by the system and not accessible to third-party apps. Q: How can I test my app on Fire TV Edition? For Android apps, you test apps the usual way, by connecting Android Debug Bridge (adb) to Fire TV then running the app from Android Studio. However, you cannot connect adb to Fire TV Edition using a USB cable. You must connect adb through the wifi network. Web apps can be tested using the Web App Tester rather than with adb. Q: How can I test my app on Fire TV Edition without a Fire TV Edition smart TV? Unfortunately, you must have a Fire TV Edition smart TV device to fully test your device. Emulators don't work reliably for testing apps with Fire TV. And the App Testing Service (ATS) does not evaluate support for Fire TV Edition. However, if you submit your APK to the Appstore and it fails for some reason on Fire TV Edition, the Appstore team will let you know why your app failed. In general, if your app works on a Fire TV device (especially Fire TV Stick), it will work on Fire TV Edition. 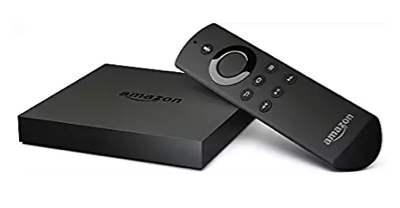 Q: If I have a Fire TV Edition smart TV, can I plug in a Fire TV device (e.g., stick, cube, pendant, set-top box) into Fire TV Edition to test support on those devices as well? Yes, you can plug a Fire TV device into your Fire TV Edition smart TV and select it as an input on your Fire TV Edition. Fire TV Edition - Insignia 4K supports up to 4k resolutions @ 60 fps and HDR10. The tech specs are comparable to Fire TV Edition - Toshiba 4K (2018). Common with Fire TV Edition features, you can control the Fire TV experience through near-field voice (using your remote control) or through far-field voice using a linked Alexa device, including controlling power, volume, channels, inputs, content, playback, smart home devices, and more. Fire TV Edition - Insignia 4K provides various customization options — you can select picture and sound settings, add Favorites to the "On" Now row, and name inputs. During setup, you don't have to sign in with an Amazon account. Even without signing in, you can still view Amazon Prime Video, Netflix, HBO, Sony PlayStation Vue, Sling, and Hulu. CPU ARM Cortex-A53 CPU up to 1.4GHz. Supports 32-bit apps. Fire TV Edition - Toshiba HD provides high-quality 2K streaming at a low cost. The tech specs are comparable to the Fire TV Edition - Insignia HD (2018). As with other Fire TV Edition smart TVs, the Toshiba HD ships with Fire OS 6 (based on Android N). The Toshiba HD has a max video resolution of 720P HD / 1080P FHD @ 60 Hz, with an Amlogic-T950Y system on chip and 1GB DDR4 memory. The software UI is the same experience as with other 2018 Fire TV Editions — you can control many settings and inputs through near-field voice (using your remote control) or through far-field voice using a linked Alexa device. When setting up the Toshiba HD, you aren't required to have an Amazon account to install popular streaming apps. Several screen sizes are available: 32" (720p), 43" (1080p), and 49" (1080p). Fire TV Cube is the first Fire TV device offering a hands-free TV experience (far field control) — you can use your voice to access, launch, and control content, turn on your TV and AV devices, switch inputs, adjust the volume, play music, and more, without a remote. When your TV is off, Fire TV Cube acts like an Amazon Echo; when your TV is on, it also acts like a Fire TV. If you have enabled voice control with your app, users can control media playback through their voice, and more. Like Fire TV (Gen 3), Fire TV Cube provides 4K ultra HD at 60 fps, HDR10 for bolder contrast and more vibrant colors, and Dolby Atmos for richer sound. Fire TV Cube's infrared blaster allows it to interact with your TV and AV setup. (High Efficiency Video Coding) video/hevc Hardware accelerated up to 3840x2160p (4K) @ 60fps, 35 Mbps, Main 10 Profile Level 5.1, Color space 8-bit and 10-bit input with HDR10 support in rendering pipelines. H.264 video/avc Hardware accelerated up to 3840x2160p @ 30fps or 1080p @ 60fps, 20 Mbps, High Profile up to Level 4.1. CPU Quad core ARM Cortex-A53 CPU up to 1.5GHz. Supports 32-bit apps. Tip: For questions about the Fire TV Cube device itself, see Fire TV Cube Voice Control Compatibility on Amazon.com. The information below relates to app development for the device. Do I need to do anything differently in my app for Fire TV Cube than for other Fire TV devices? Your app should work the same on Fire TV Cube as it does on other devices. However, Fire TV Cube tries to provide more of a hands-free TV experience, letting users control their TV, search for content, play/rewind/fast-forward content, etc., with their voice (without the need to push the voice button on a remote control). As such, to align with the voice interactivity of Fire TV, you should voice-enable your app. How can I voice-enable my app? Video Skill API: The Video Skill API provides a deep integration of your app's functionality and content with voice. Video Skill API integration allows customers to use their voice to search and find your app's content (from Fire TV's universal search, not just within your app), launch content, control media playback, and more. Video Skill API integration has a couple of prerequisites. First, your content must be integrated into the Amazon Catalog. To qualify for Catalog integration, if you have video-on-demand content, it must be in IMDb. After your app has gone through catalog integration, reach out to a solutions architect at Amazon for more information about integrating the Video Skill API. See the Video Skill API section in "Voice-enabling Your App and Content" for more details. MediaSession: MediaSession lets users control your app's media playback through voice controls. First, check to see if you have already implemented the Android Media Sessions API. If you have, all you need to do is add a permission to your app's manifest file and implement voice commands for transport controls like play, pause, resume, rewind, fast-forward, and skip content. See Implement Voice-enabled Transport Controls with the Android Media Session API for details. If you haven't implemented MediaSession in your app, see this getting started with MediaSession tutorial. If you're just starting to develop an app, note that Fire App Builder, a Java Android framework for building Fire TV apps, already has MediaSession enabled with voice. Tip: See Voice-enabling Your App and Content for more details. Fire TV Edition - Toshiba 4K supports up to 4k resolutions @ 60 fps and HDR10. The tech specs are comparable to Fire TV Edition - Insignia 4K (2018). Common with Fire TV Edition features, you can control the Fire TV experience through near-field voice (using your remote control) or through far-field voice using a linked Alexa device, including controlling power, volume, channels, inputs, content, playback, smart home devices, and more. Fire TV Edition - Toshiba 4K provides various customization options — you can select picture and sound settings, add Favorites to the "On" Now row, and name inputs. During setup, you don't have to sign in with an Amazon account. Even without signing in, you can still view Amazon Prime Video, Netflix, HBO, Sony PlayStation Vue, Sling, and Hulu. Fire TV (Gen 3) was released in October 2017 and supports resolutions up to 4K ultra HD at 60 fps. It also supports HDR10 (High Dynamic Range, which results in bolder contrast and more vibrant colors) and supports Dolby Atmos for richer sound. Gen 3 has a pendant form factor, making it less visible and more portable (this form contrasts with the set-top box form of the Gen 1 and Gen 2 models). Its 1.5 Ghz quad core processor has more power than the stick, and it has a micro USB port that can optionally accept an Ethernet adapter. Gen 3 is currently the only device running Fire OS 6, which is based on Android API level 25. 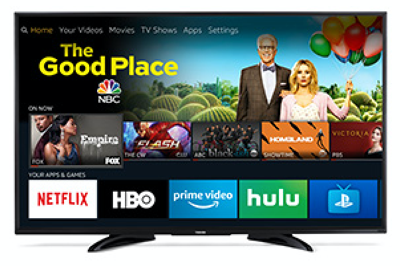 Fire TV Edition - Element 4K was the first integration of Fire TV directly into the TV manufacturer's hardware (in this case, into Element TVs). Fire TV Edition (Element) supports resolutions up to 4K ultra HD at 60 fps. Unique to the smart TV platform, it can also integrate live over-the-air TV broadcasts with streaming apps and channels. The Element comes in four sizes, from 43-inch up to 65-inch displays. Element runs Fire OS 5. See the FAQ for more details. (High Efficiency Video Coding) video/hevc Hardware accelerated up to 3840x2160p (4K) @ 60fps. Main/Main10 profiles, High Tier, Level 5.1. DRC within 16msec. CPU Dual CA72 + Dual CA53 up to 1.4Ghz. Supports 32-bit apps. Expandable Storage SD available up to 128GB. microSD cards can be supported through an adapter. Fire TV Stick (Basic Edition), released in November 2017, is a more globally available version of the Fire TV Stick (Gen 2). Whereas Fire TV Stick (Gen 2) is available in US, UK, Germany, Japan, and India, the Fire TV Stick Basic Edition is available outside these areas in more than 100 countries or territories. From a hardware perspective, the specs for Fire TV Stick Basic Edition and Fire TV Stick (Gen 2) are largely the same (the build model, AFTT, is even the same) except the Basic Edition doesn’t ship with an Alexa Voice Remote, and the UI is simplified with more of an app-centric experience. For example, the "Recommended By Your Apps" rows that is normally populated through Recommendations isn't shown. The tabs on the top row are simplified, and you find apps by browsing the available categories rather than using search. CPU Quad-core ARM 1.3 GHz. Supports 32-bit apps. How does Fire TV Basic Edition differ from Fire TV Stick (Gen 2)? From a hardware perspective, the specs for Fire TV Stick (Gen 2) and Fire TV Stick Basic Edition are largely the same (the build model, AFTT, is even the same) except that the Basic Edition doesn’t ship with an Alexa Voice Remote, and the UI is simplified with more of an app-centric experience. For example, the "Recommended By Your Apps" rows that is normally populated through Recommendations isn't shown on Basic Edition. The tabs on the top row are simplified, and you find apps by browsing the available categories rather than using search. Fire TV Stick (Gen 2) was released in September 2016 and is the latest version of the Fire TV Stick. Its maximum supported resolution is 1080p @ 30fps, and its CPU is 1.3 Ghz. This device is the bestselling Amazon Fire TV device by a wide margin. The stick form factor doesn't provide any Ethernet ports, so for any testing and sideloading of apps, you connect via adb wirelessly. This device's specs are similar to the Fire TV Basic Edition (which is its globally available twin); the difference with Basic Edition is in the user interface. Fire TV (Gen 2) was released in September 2015 and supports resolutions up to 4K ultra HD. In contrast to the Gen 3 model, the Gen 2 has a set-top box form factor, provides a USB port, has a direct Ethernet port, and runs Fire OS 5. Its fast CPU (2 Ghz and 1.5 Ghz dual cores) gives it strong processing power, and it is compatible with a game controller. The Gen 2 device is now available in stores only as a refurbished device. (High Efficiency Video Coding) video/hevc Hardware accelerated up to 3840x2160p (4K) @ 30fps, 25 Mbps, Main 10 Profile Level 5.0, Color space 8-bit and 10-bit input but just 8-bit output. CPU Quad Core (dual core ARM Cortex A72 up to 2 GHz, dual core ARM Cortex A53 up to 1.573 Ghz). Supports 32-bit apps. Fire TV Stick (Gen 1) was the first Fire TV Stick, released in November 2014. At the time, the stick form factor provided a more lightweight an affordable alternative to the more robust Fire TV set-top box. Gen 1 supports 1080p @ 30fps resolution and has a 1 Ghz CPU. This device is no longer sold in the stores and is not as common among Amazon customers. CPU Dual Core ARM Cortex A9 up to 1 GHz. Supports 32-bit apps. Fire TV (Gen 1) was the first Fire TV, released in April 2014. Its form factor is similar to Gen 2, but its maximum resolution is only 1080p @ 30fps. Like Gen 2, it runs Fire OS 5 and has similar ports. This device is no longer sold in stores and is not likely common among Amazon customers. CPU Quad Core Qualcomm Krait 300 up to 1.7 GHz. Supports 32-bit apps.